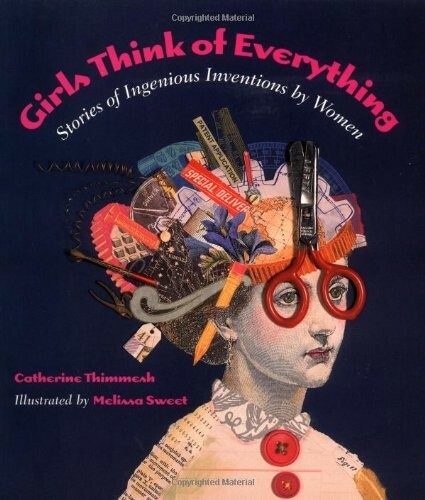 Girls Think of Everything: Stories of Ingenious Inventions by Women, written by Catherine Thimmesh illustrated by Melissa Sweet is a collection of biographies of simply amazing women who have changed the world with their incredible inventions. Isabella showed extreme interest in this book as we browsed the shelves at the library. She truly picked a winner. With a current interest in engineering, tinkering with her (GolidBlox) this book was a perfect fit. Girls Think of Everything is anything but boring! Not the usual recitation of facts, it will captivate and delight while teaching children and adults at the same time. It is not filled with a dry history of inventions and inventors but stories of ingenious women and how they invented out of necessity or ingenuity and hard work or even by ACCIDENT (as the case with the chocolate chip cookie). This book is not only an informative, collection of biographies. It is inspirational. Telling stories of how these women beat the odds and invented amazing things that changed the world forever. It also features kids! Like Becky Schroeder, who at 10 years old invented Glo-sheet paper, which enables people to write in the dark. She became the youngest female to receive a U.S. Patent. This book inspires and encourages girls to invent! It even gives a list of resources such as a list of organizations with postal and Internet addresses to help them get started. Not only is the writing fabulous but the art and design in this book is just a captivating. You feel like you are looking through a scrapbook and seeing glimpses of these women’s hard work, struggles and triumphs. If your child is interested in inventing. Or they simply would be interested in learning about these amazing inventions, than you shouldn’t hesitate to check this book out. We loved it so much! After checking it out at the library and renewing it many times, we bought it!